Brown Booby. Photo October 30, 2009 by Russ Namitz. Click photo for larger view. To add to yesterday's post of the Brown Booby in Coos Bay, Oregon, Russ Namitz sent the photo above. The sun came out today, but the bird is still distant, out in the channel. Today's photo shows fairly clearly that this is an adult female, by the dark spot in front of the eye on the pale bill and dull yellow feet. An adult male would show darker bluish facial skin, bright yellow feet, and perhaps even darker brown upperpart plumage. It is assumed this is the race that breeds in the Sea of Cortez (Gulf of California). The males of this population have frosty heads unlike the all-dark heads of male birds in the Gulf of Mexico. However, the plumage of females is similar between the two populations. Short-tailed Albatross with radio transmitter photographed at Half Moon Bay, California on 11 October 2009 by Kris Olson. See more photos from this trip on Kris's Flickr site. Click for larger view. 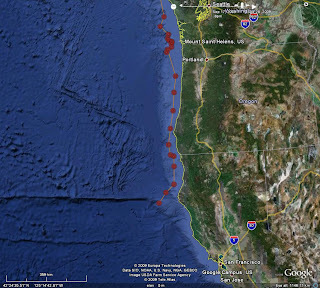 Last week I reported on a juvenile radio-tagged Short-tailed Albatross that journeyed past Oregon's shores from 25-29 September. When we last left Y18, our young hero that fledged in May off Japan had just spent some days off the mouth of the Columbia River. It then flew down the Oregon coast and dissapeared into California waters. 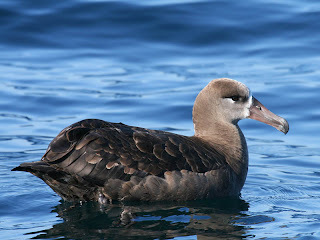 On 11 October 2009 a pelagic trip from Half Moon Bay, California photographed one of 7 radio-tagged Short-tailed Albatrosses from Japan. Was it, perhaps, the same bird seen off Oregon two weeks earlier? Yes it was! The flight path of Y18, May to October 2009. Provided by Rob Suryan, Oregon State University. Click for larger view. Rob Suryan provided this map showing the past 5 months of travels of this bird. It fledged in May, flew north to the Aleutians, then down the West Coast to California. Then it headed back north, finally losing the transmitter on the 16th of October off British Columbia. I don't know about you, but I find this terribly exciting! 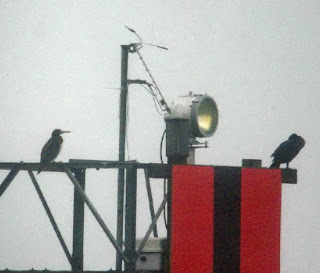 Brown Booby (left) and Double-crested Cormorant (right). Photo October 29, 2009 by Russ Namitz. Click photo for larger view. Birders in Oregon were excited recently when an adult Brown Booby was discovered in Coos Bay. The first photo was posted to Oregon Birders On-Line by Owen Schmidt on the afternoon of October 29. At approximately 10:00 AM on October 26th, 2009, Suzette Eagler was crabbing with her husband by boat in the lower bay on the western shore of Coos Bay. She recognized the bird as possibly being a booby species and contacted OIMB. The message was forward Professor Jan Hodder who then emailed me in the afternoon. Tim Rodenkirk and I went out searching in the late afternoon and relocated the bird around 5PM. We called Dave Lauten and Kathy Castelein to inform them that we were looking at the bird. They drove to Fossil Pt. where I was still looking at the bird. The bird was viewable from Fossil Pt., Pigeon Pt. and the highway overlook near the "Octagon" house, according to Namitz. The bird was roosting on a wooden day marker that was located between the floating red buoys 10 and 10A. Views, thus far, have been quite distant. The bird remained overnight and many birders were able to observe the bird. 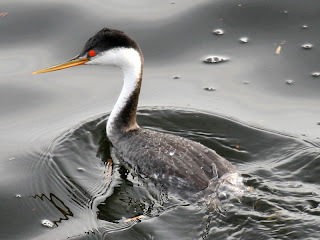 There are 3 previous records accepted by the Oregon Bird Records Committee. Additionally, there are two word-of-mouth sight reports, amazingly from the same day in 1995, about 150 miles apart. 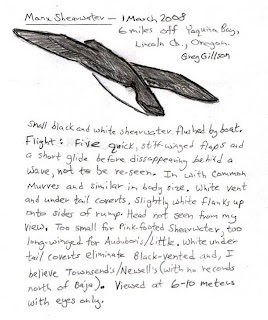 3 October 1998: juvenile 15 mi WSW of Depoe Bay, Lincoln Co. (The Bird Guide, Inc., OBRC accepted). 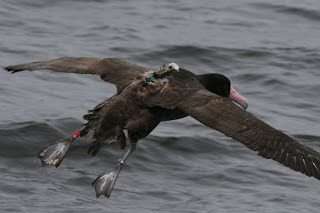 May 2005: 1 adult along coast of Tillamook and Lincoln Cos. (photo, OBRC accepted). A bloom of Akashiwo sanguinea on the ocean shores of Washington and northern Oregon has killed hundreds of seabirds, according to a report by Lynne Terry of The Oregonian newspaper. The algae turns into a sticky froth in the surf. This soap-like foam destroys the waterproofing in the seabirds feathers. The article says that in September it was mostly scoters that were killed off Washington State in a rare outbreak. Experts were surprised when another outbreak struck again in October, this time hitting primarily murres, loons, and grebes. Many birds have appeared on the beach, resting, but otherwise appearing healthy. Those less healthy are being treated by rehabilitators, which were temporarily overwhelmed. The Wildlife Center of the North Coast, in Astoria, Oregon, arranged to fly about 300 birds to another facility in California. Update: Here is another article with photos and a video clip from The Daily Astorian. While conducting a seawatch from Boiler Bay, Lincoln County, Oregon, on 18 October 2009 Wayne Hoffman spotted a very likely Greater Shearwater. ...had white underparts, dark back. As it flared to land, it showed a white band across the tail base. Seemed a bit smaller than Pink-foot, larger than Sooty. There is one previous record of Greater Shearwater in Oregon, 9 August 2008 (trip report with photos) about 18 miles offshore Newport, Oregon. Boiler Bay is a great place to watch seabirds at this time of year. Wayne also saw about 100 Sooty Shearwaters, 400 Sooty/Short-tailed Shearwaters, 30 Buller's Shearwaters, 18 Pink-footed Shearwaters, and 25 dark phase Northern Fulmars from 8:15-10:45 am. This photo is one of a series by Sharon Toochin of an apparent first photographically documented record of Solander's Petrel in North America. Photo used with permission. Click photo for larger view. The status of Solander's Petrel, also known as Providence Petrel, Pterodroma solanderi, is an enigma off the Pacific coast of North America. At-sea identification of fly-by out-of-range birds is difficult, as these birds are very similar to Murphy's Petrels. 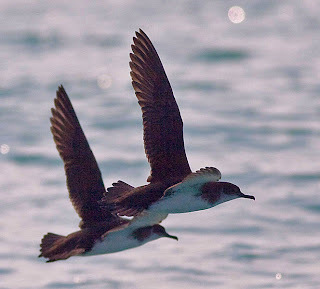 Both of these birds of open ocean are dark birds about the size of a small Sooty Shearwater. These petrels are generally not attracted to vessels or chum, are solitary wanderers, and fly in fast bounding flight. The first North American report of Solander's Petrel was by experienced seabird researcher R.L. Pitman (Bailey 1989). He spotted 4 dark Pterodroma 55-70 miles off Oregon on 20 May 1981. He identified them as Solander's Petrels. His cruise continued into California waters, where he found many more dark petrels. These, however, he identified as Murphy's Petrels. Both sightings would have been North American firsts. The very next month, on 15 June 1981, a beach-cast specimen of Murphy's Petrel was found near Newport, Oregon. Subsequently, through the 1980's, a couple more Murphy's Petrels washed up on Oregon's shores, and California birders discovered that Murphy's Petrels were the most common spring seabird more than 50 miles off California. Pitman's identification as Solander's Petrel was not generally accepted. Many of these reports of Murphy's Petrels come from seabird researcher Michael Force during marine mammal and seabird surveys in 1994 and 1997. On 18 April 1994 Force reported 21 Murphy's Petrels and 1 Solander's Petrel about 180 miles off Waldport, Oregon. 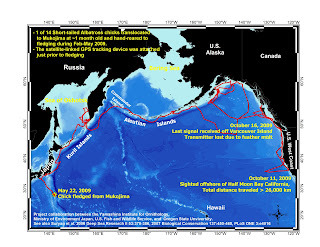 Again, on 12 May 1997 Force recorded 2 Murphy's Petrels and 2 Solander's Petrels 140 miles off Florence, Oregon. 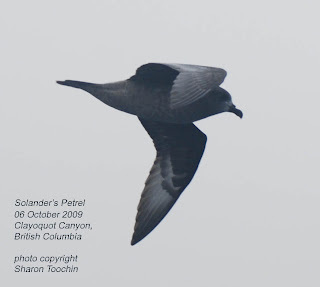 There are two additional reports of Solander's Petrels off the West Coast, bringing the total to 5 reports. 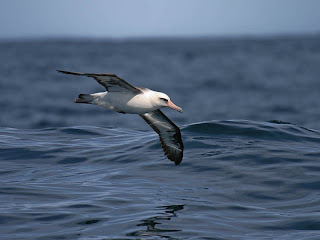 A bird was photographed 173 miles off Cape Mendocino, California on 8 August 2005. But this bird was apparently not accepted by the California Records Committee. A sight record came from off Westport, Washington, on 11 September 1983. So, 5 previous reports of Solander's Petrels, with no accepted verifiable objective evidence, brings us to the most recent set of photographs. The field marks of Murphy's and Solander's Petrels are not well shown in Harrison's 1983 Seabirds: an identification guide (too dark brown, inaccurate tail shape). Murphy's Petrel is shown fairly well in The Sibley Guide to Birds, 2000. Murphy's is dark gray, the bill is short and small, there is more white on the chin than above the bill, and the tail is rounded. There is a variable light-dependant flash on the under flight feathers. The first thing that stands out on the bird photographed above (click photo for larger view), is that the bill is long and heavy. The bases of the primaries are white, the tips of the greater primary coverts are dark and bases light. These form a white patch divided by a dark bar between the primaries and the greater primary coverts. There is more white on the face above the bill than on the chin. The tail appears to be longer and pointed. This looks like a good "first" North American record! White-chinned Petrel copyright 2009 by John Sterling. Used with permission. Click photo for larger view. This past weekend, on October 18, a pelagic trip from Half Moon Bay, California recorded the first California and second North American record of White-chinned Petrel, Procellaria aequinoctialis. More details can be found on the American Birding Association's blog, Peeps Online. 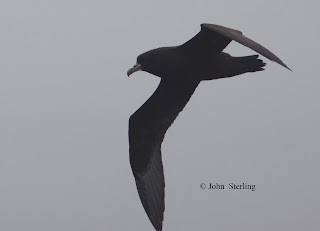 This large dark petrel is larger and bulkier than a Flesh-footed Shearwater. It has a bill very similar to a Northern Fulmar (not thin as in the shearwaters). But the bird is larger and more long-winged than a fulmar, with a pointed tail. Each of the bill plates of the White-chinned Petrel is outlined in black, and the tip is pale. There are several photos of this bird by Alvaro Jaramillo and John Sterling (Rare California Birds page). The similar, but smaller, Parkinson's Petrel, Procellaria parkinsoni, has been reported three times off California (2 photographed) and once off Oregon. See: Rare Seabirds of Oregon. This may be the first photographic evidence of Manx Shearwaters in Alaska. 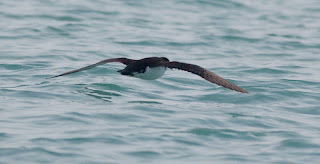 Information I received from Steve Heinl in Ketchikan was that "People have been seeing Manx Shearwaters in the NE Gulf of Alaska in small numbers for the past 5 years or so." Steve Mlodinow wrote a status article "Manx Shearwaters in the North Pacific Ocean" in Birding, December 2004, pp. 608-615. Mlodinow followed that up with a Letter to the Editor in Birding, August 2005 (Vol 37, Number 4, pp. 348-349). In this letter he wrote that nest-site prospecting was suspected on Triangle Island, BC, in 1994. Nocturnal voice recording surveys at a seabird colony there in July of that year recorded calls that were consistent with Manx Shearwater. They were "regularly" encountered on at-sea surveys off British Columbia in summer 2004 according to Ken Morgan. Manx Shearwater by Nick Hatch, Icy Bay, Alaska, August 4, 2009. Manx Shearwaters began appearing regularly off California in the 1990's (12 reports from California and Washington in 1994). It is no longer a Review species in California, with over 100 accepted records. Copy of March 1, 2008, Manx Shearwater report to OBRC by Greg Gillson. Manx Shearwater reports from Oregon for the past decade have averaged over 6 birds per year. There have been an additional 25 (2.5 per year average) unidentified Manx/Black-vented Shearwaters reported during this time. There are 10 total Oregon reports of definite Black-vented Shearwaters, 4 accepted by the OBRC. So the unidentified small black-and-white shearwaters can't be assumed to be one or the other species. The date of our first trip of 2010 is now set. Saturday, March 6, 2010 will be an 11-hour Perpetua Bank trip with Laysan Albatross as the target species. This wonderful bird has been spotted on 7 of 8 February and March Perpetua Bank trips, with a high of 8 birds. This early March date gives us the best sea conditions of "winter." Expected winter seabirds in addition to Laysan Albatross include Short-tailed Shearwater (6 of 8), Thayer's Gull (5 of 8), Black-legged Kittiwake (8 of 8), and Ancient Murrelet (5 of 8). Rarities in the past have included Short-tailed Albatross (twice), Manx Shearwater (twice), Flesh-footed Shearwater (twice), Leach's Storm-Petrel (once), Glaucous Gull (twice), and Horned Puffin (twice). The common regular species include Black-footed Albatross, Northern Fulmar, Pink-footed Shearwater, Sooty Shearwater, California Gull, Herring Gull, Glaucous-winged Gull, Western Gull, Common Murre, Pigeon Guillemot, Marbled Murrelet, Cassin's Auklet, and Rhinoceros Auklet. We may see Rock Sandpiper on the jetties as we make our way along the bay. Peregrine Falcons are also regularly spotted in the bay while we are on the boat. Three species of loons, 3 species of scoters, 3 species of cormorants, Red-necked and other grebes.... This is a fun time to take a pelagic trip. Please visit the Bird Guide's pelagic web site for the most up-to-date information and price. 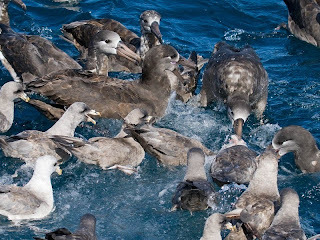 Feeding frenzy; Black-footed Albatrosses and Northern Fulmars. Our final trip of 2009 was well attended and a great success. Most of our guides joined this trip to help spot birds and explain ID to our guests. We didn't have any rarities on this trip, but we were surprised to see Brown Pelicans diving into the sea for food up to 12 miles from shore. A few photos from the trip gradually are being placed on my pBase photo site.